For the 15th time since he was sworn in as US president, Barack Obama attempted on Thursday to make some sense of an act of mass gun violence and the laws that allowed it to happen. Nine people had been killed and seven injured in a shooting at an Oregon school before the assailant was shot dead by police. The president was at turns angry, weary and apparently resigned to the intractable opposition he faces in tightening gun regulation. A list of some of the statistics on US gun violence reveals just how routine mass shootings and other firearm incidents are in a country with nearly as many guns as people. Over the course of his presidency, Mr Obama has spoken publicly or issued a statement in the wake of 15 mass shootings. But the deaths in Oregon were the 994th mass shooting of his second term alone - since November 2012. There have been 294 mass shootings - defined as an incident in which four or more people are killed or injured by gun - so far in 2015, more than one per day. Over the same period, there have been 45 shootings at schools, and 142 such incidents since the massacre at Sandy Hook elementary on 14 December 2012 - although those figures include occasions when a gun was fired but no-one was hurt. And while it is the school shootings and other mass shootings that capture the world's attention, the vast majority of gun deaths in the US occur in smaller, often unreported incidents. According to the Gun Violence Archive, 9,956 people have been killed by firearms so far this year and more than 20,000 have been injured. So many people die annually from gunfire in the US that the death toll between 1968 and 2011 eclipses all wars ever fought by the country. According to research by Politifact, there were about 1.4 million firearm deaths in that period, compared with 1.2 million US deaths in every conflict from the Revolutionary War to Iraq. Once again, Mr Obama compared America's response to that of countries such as the UK and Australia, where strict gun laws were put in place in the wake of mass shootings. "We know that other countries, in response to one mass shooting, have been able to craft laws that almost eliminate mass shootings," he said. "Friends of ours, allies of ours - Great Britain, Australia, countries like ours. So we know there are ways to prevent it." And the statistics bear that out: the number of per capita gun murders in the US in 2012 - the most recent year for comparable statistics - is nearly 30 times that in the UK, at 2.9 per 100,000 compared with just 0.1. Of all the murders in the US in 2012, 60% were by firearm compared with just 10% in the UK. No official figure exists for the number of guns in the US but there are thought to be about 300 million, concentrated in the hands of about a third of the population. That's nearly enough guns for every man, woman and child in the country to own one each. The right for citizens to own those guns is protected by the Second Amendment of the US Constitution and fiercely defended by lobby groups such as the National Rifle Association, which boasted that its membership surged to around five million members in the aftermath of the Sandy Hook shooting. Faced with such staunch opposition to his desire for tighter gun laws, President Obama called on the media on Thursday to compare the number of US citizens killed by terrorism to those killed by gun violence. 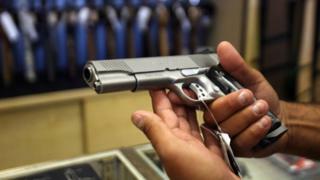 According to figures from the US Department of Justice and Council on Foreign Affairs, 11,385 people died on average annually in firearm incidents in the US between 2001 and 2011. In the same period, an average of 517 people were killed annually in terror-related incidents. Removing 2001, when 9/11 occurred, leaves an annual average of just 31.